There is a lot of different tactics on how to farm and how to set up bases, with that said there is not a cookie cutter approach and for best results adjust your farming to the specific situation. This is just a suggestion as many different variations have been tried but this was found to work best for myself. Paying close attention to the small details over several cities makes a massive difference. This may seem like quite an obvious thing to do but you’d be surprized how often people dont make their city fields all one resource. This is about maximizing the valleys and the fields you have. Fields must all be one resource and you should be actively working to get them all upgraded to level 10. If you are concerned about population, why? This is a feeder city. You should not be loaded up on barracks and population is not a problem. Another idea to think about is if you are valley farming or constantly “capping” your resources(resources stop producing) that keeping level 10 farms could benefit you more since they do not cap with troops building food. It is also much more difficult to cap a city with farms and warehouses as you cannot clear the food. Why would you not take valleys to maximize your resources, once again make sure your farm fields are all the same. One city that is setup well is worth the resources of multiple cities. You will be taking level 10 valleys of the same type. Refer to the resources chart and you can get an idea of how much this real means. The devil is in the details. All non essential buildings should be demo’d. For an initial 10 build this would include stable, workshop, forge, inn and market. You are probably wondering why I said both inn and market. The reason you initially demo both is because there is no reason to have a level 10 inn and a level 10 market. When you first need heroes you have a level 1 inn so that you can chose heroes with a high base. After your heroes have been recruited convert it to a level 1 market. This can be very easily flip flopped in the future and also save a spot. This is what I recommend on other buildings. They are smart game play and gives you the ability to not defend. One strong city is better then several weak cities. Use these to keep your cities alive. Since to comfort you will need food I would suggest using 85-5-5-5. This also gives you just enough resources to build a trap/abatis to show up and defend someone suddenly if you choose. 1-3 Warehouses, at least have one. If you are facing heat it’s time to make some more. 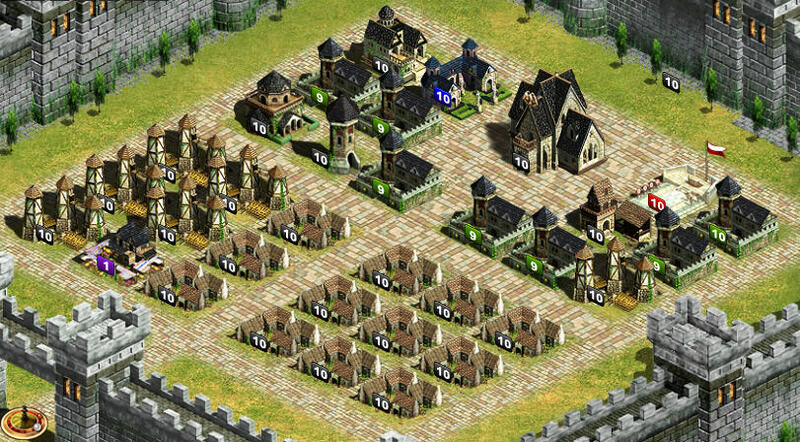 Cottages and barracks, this really depends on your heroes and ability to create troops. What I would recommend as you transition is do not over your barracks, what this means if archers are the main thing you produce then run something like 8 level 9 barracks and 6 level 4 barracks. You can easily tear down the level 4s for more cottages as you transition or to make more warehouses when you are under fire. 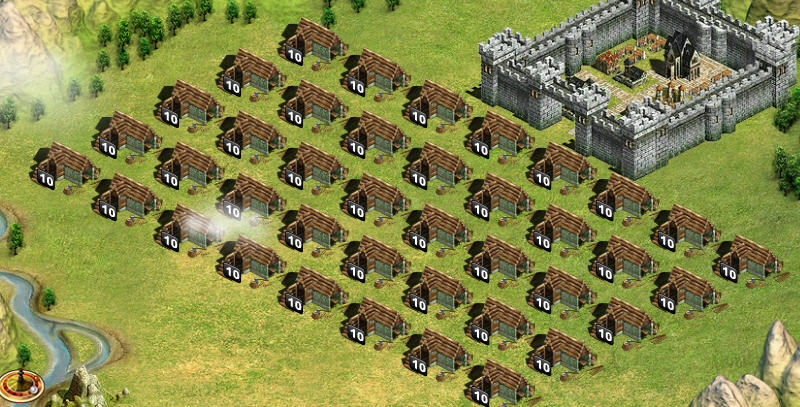 12 cottages, give you enough for 40 level 10 fields and enough to easily queue troops. 7 barracks, you don’t need much more then this because this city is for farming, not for building troops. This many barracks is enough to passively recover farm teams quickly. 6 warehouses, now this seems like overkill right? That is the entire point. These warehouses can protect your farm teams when gates are closed from refuging. You can easily comfort with this and your market can get you food long enough to comfort. Upgrade stockpile all the way, this increases storage capacity of warehouses and your production, this is important! The next and most major point is nobody is going to invest a lot of time in a city with 6 warehouses after noticing them on a scouting report. Would you? I think not. This is just a suggested way of running and like mentioned before everyone will have their own style but remember this is a farming city. If you for some reason think you need a lot more barracks then you should probably rethink the purpose of this city. I’ve heard a lot of ways of people doing this but I strongly recruiting heroes with strong bases for a few reasons. First, maximize your production by running a double queen. They will alternate in farming and both level. Months down the road you’ll have politic heroes in 300s bringing in huge resources across all cities. Secondly the heroes can be moved to main accounts. You can keep these heroes unleveled and move at a later date or move them as they are. Then lastly though these are farm cities they can help minimally with scouting, attacking and training. I recommend having a semi decent hero that you rotate to train in all cities. Remember these are farm cities so nothing too big. Lots of different theories on this and believe me I’ve tried them all. Here is what I’d recommend on my experiences. 25k transports, assist in farming, enough to hide resources and transport a quarter billion. I wouldn’t go much more then this unless you are frequently getting clogged up. You need fairly minimal transports if you are cascading shipments which I will go into in a future post. 5k workers, you should be closing flats around you. Players who don’t often find their cities getting attacked more because they have flats all around them. If you are not making npc5, what are you farming? Remember it’s about maximizing resources. 150k scouts, this is the easiest and quickest ways to take flats and valleys. This also helps you use these cities as support cities for attacks as needed. This is a more flexible alternative to using archers. There wont be too much reason for you to have walls since this city is no designed to defend. You may find that you need to defend a city at some point so I’d suggest having 100 traps/abatis set up in case you need a quick ranged defense. I would make my walls either the rest trebs or pure trebs. This is avoidance of any honor and also drops your honor if you are hit. Another great side is if you are hit you could win free items like teleports. Keep your gates closed. Do not give anyone any opportunity to kill your farm teams and stop your production. Remember you can hide your resources and you have plenty of warehouses to help keep your troops from refuge. The final and most important part of this is these are farm cities and therefor the resources/troops should constantly be routing out of reach of any attacker. Make sure everything goes to one strong city. This keeps resources out of reach therefore making you a non-target, someone not worth hitting. Especially in competitive farming fields you will want to farm in a tighter radius because you can simply get it faster and more often. You want to hit every change you get regardless of it’s been 8 hours or not. If you are constantly reaching your fields before others you maintain food and starve them out. This is a great tactic and people typically leave in a hurry. Your heroes also level faster which means your fields produce better because you have strong politic heroes. Last but not least, even though you may take a cut in resources in non competitive areas by farming in a tighter radius did you realize that npcs that are hit the least are cleared first during npcs resets? Farm your closest npcs to you more and the odds of them getting deleted go down. You continue to farm and keep others at a distance by farming tigher and more often. 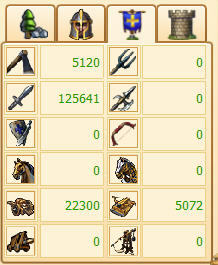 Set up correctly and you’ll soon have enough resources to make you one of the biggest players on your Evony server.